It’s 2017. Australian arts audiences hit 15.7 million, the Art Gallery of NSW receives a $244 million grant, and arts centre ‘107’ is operating out of a disused garage. How does a rebel rise to the top? Since 2001, not-for-profit arts centre ‘107’ has operated as a gallery and drop-in space for emerging artists. With the move to a new home in inner-city Redfern, 107 decided it was time to step up and become a serious player in the Sydney arts scene. 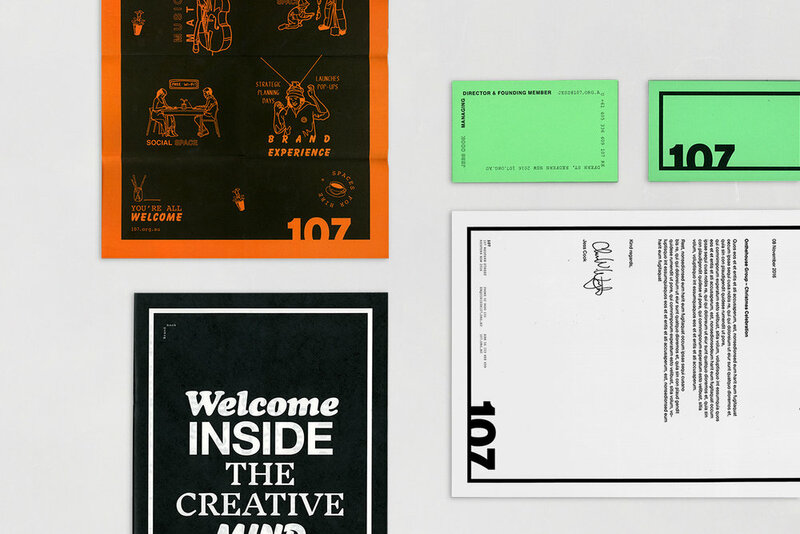 107 has always been a space for creativity to run free, however as a brand it was running wild. It needed a clear identity in order to be seen as a credible venue to attract artists, visitors and funding. All art has dirty beginnings. 107 is not a pristine, white-walled gallery like those found throughout every major city, and it never wants to be. The identity acknowledges 107’s roots as a space for experimentation and discovery. 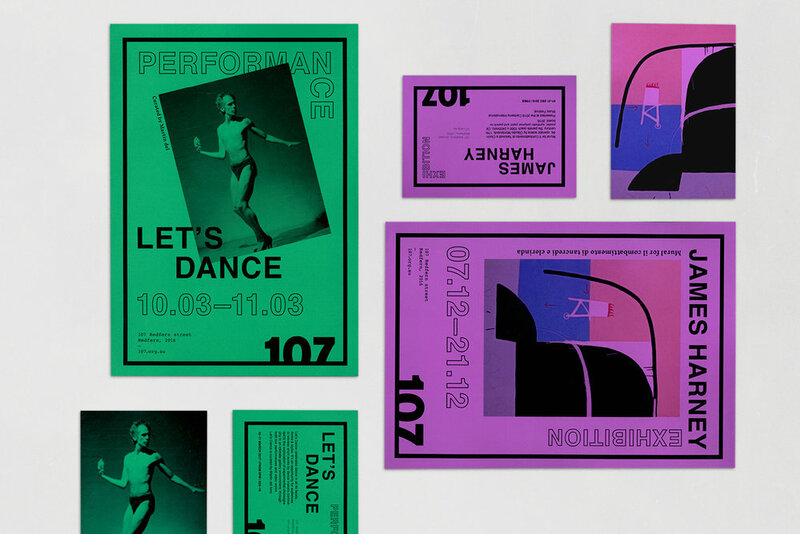 Seven brand fonts and a mix-and-match aesthetic capture the collaborative, ever-evolving nature of artistic expression. The identity is designed to welcome people in. Signage throughout the space encourages passers-by to step inside and enjoy themselves. For community events, the brand elements can be dialled up to their most expressive and exuberant. 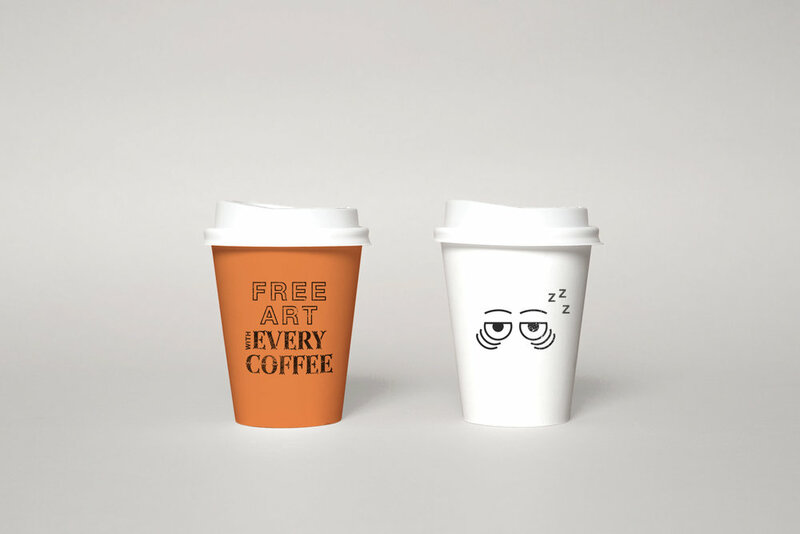 Whereas for exhibitor and donor communications, the brand can be stripped back to be super slick. 107 has gone from strength to strength. Described as “one of the city’s most successful creative arts centres” by the Lord Mayor, it is cementing its position as a force to be reckoned with on the Sydney arts scene. Josh Gilchrist for the Screen printing and the all 107 team for their collaboration. The results are in and we're delighted to announce we have been shortlisted five times at the 2017 Best Awards.